The following quotations for May and July as indicated were posted by the CME at close of trading on Friday April 5th together with values for the previous week in parentheses. The market showed a rise in the futures prices of corn, soybeans and soybean meal for May and July delivery compared to the previous week. This was attributed to messages from the White House regarding a possible settlement of the trade dispute with China. Premature optimism apparently offset the negative effect of the release of the USDA Grain Stocks Report on Friday afternoon March 29 th documenting soybean stocks. There is increasing optimism concerning the outcome of the ongoing negotiations between China and the U.S. An extension of the March 31 st deadline to raise tariffs from ten percent to twenty-five percent on over $200 billion in annual imports from China is now a reality. In return China has agreed to purchase an unspecified quantity of agricultural commodities in addition to energy and heavy equipment from the U.S. to offset the negative balance of payments. Negotiations with China are apparently making progress as denoted by shuttles between Beijing and Washington, but without any disclosure of specifics or dates. Some concessions have been made by China on coercive trade practices. From an agricultural perspective the question of delays by China in approving new GM cultivars has yet to be resolved. No date has been set for a summit to sign a trade deal. Markets are now cautiously responding to conflicting reports from the Administration but prices will be influenced subsequently by current stock levels, area to be planted and early crop progress in the face of possible flooding. According to the March 8th 2018 WASDE Report #586, 81.7 million acres of corn will be harvested in 2019 to produce 14.42 Billion bushels. 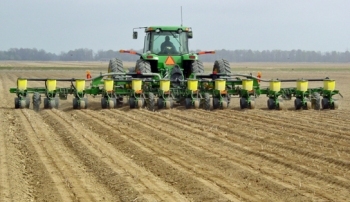 The soybean crop is projected to attain 4.54 Billion bushels from 88.1 million acres harvested. The levels of production for the two commodities are based on preliminary pre-planting projections of yield and acreage. Ending stocks were revised based on anticipated domestic use and exports. See the WASDE posting summarizing the March 8th USDA-WASDE Report #586 under the STATISTICS tab documenting price projections and quantities of commodities to be produced, used and exported from the 2019 harvest. Unless shipments of corn and soybeans to China resume in volume, as anticipated, the financial future for row-crop farmers appears bleak despite the release of two tranches amounting to $8 billion as "short-term" compensation for producers of commodities. Eligible soybean farmers received $1.61 per bushel. Corn farmers will not be placated by the promise of a year-round E-15 blend since the logistic problems of delivery to consumers and legal challenges will delay any positive price benefit. Oversupply of ethanol with the current 10 percent addition (read BTU dilution) mandate is evident from the March 29th spot price of $1.38 per gallon ($1.42 last week) that has not changed materially in ten weeks compared with a peak in late March 2018 at $1.60. Exports have been constrained by the retaliatory tariffs imposed by China on U.S. ethanol. Some refiners are reducing production and mothballing corn-fermentation plants. Corn farmers can be relieved that overly optimistic and unfounded projections of cellulosic ethanol to be available after 2017 have not materialized, based on technical complications and predicted financial infeasibility.